I think our away form is always likely to let us down and mean that 3 wins and 3/4 place is our best hope until we break some of these hoodoos in Paris London and Cardiff. haven’t won an away six nations match that wasn’t in Rome in nearly a decade I.e. since Dan Parks scored the last minute pen at Croke Park in 2010. That' what I thought but I'm no expert on the rules of TMO. Think the referee blew the whistle before Hogg had crossed the line, so even it the TMO had had a look at it, it wouldn't have been given as a try. The ref should really have let it play out then go back and see if there was obstruction, that way it probably would have been given as a try. Not like other TMO situations quoted. Italian players could have stopped playing. Gamesmanship by the Italian which is disappointing. Sad to see Ireland thumped by the residency XV. To a greater or lesser degree all the home nations are at it. Yep. Ireland, England and Wales have about the same number of foreign-born players, and Scotland have more than any of those. About 22% of the players who played in the 2015 World Cup were born in a different country to the one they represented at the competition. The only country who took part in that tournament with all "home-born" players was Argentina. 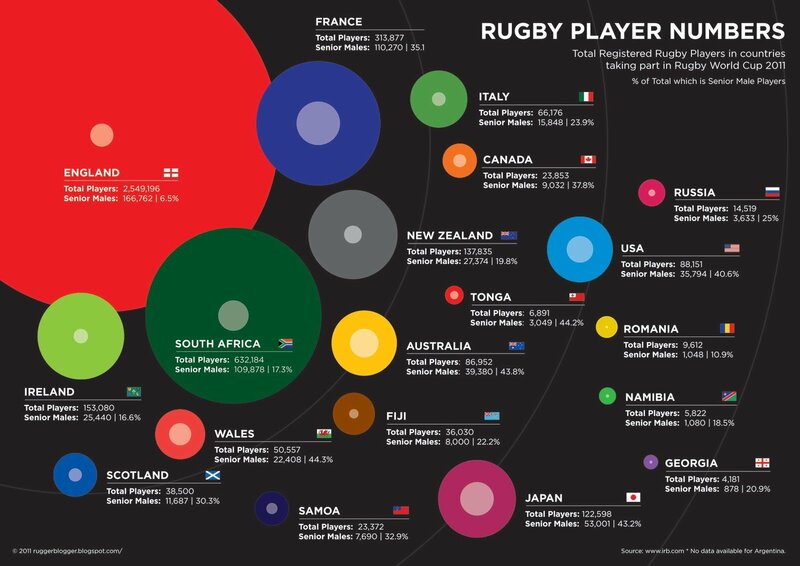 How many residential players tho, Scotland has the least. Don't think the graph takes into account parentage or grandparents etc. I thought that myself. 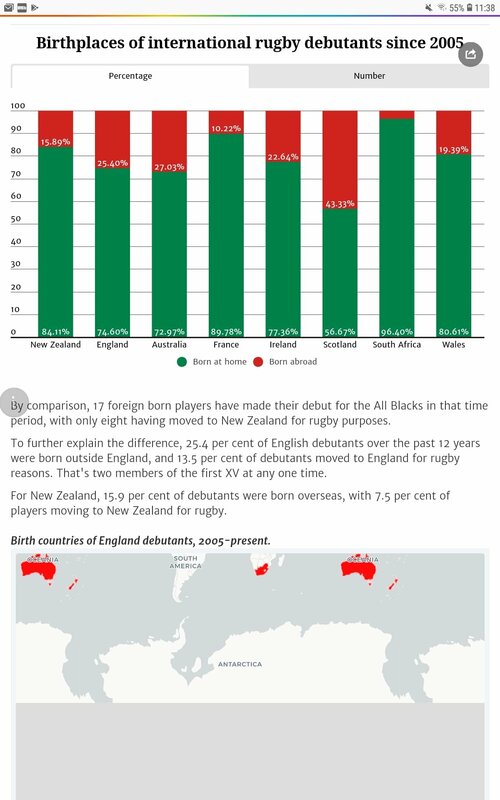 It's a bit misleading but there's no doubt we as a country have taken advantage of residency and every other rule to gain players. Toner, Ringrose, & Stander, all confirmed out for the weekend. I'd have preferred to see Kinghorn in the starting XV. Not because he ran in three tries last week (Maitland or Seymour would have got them too on that wing) but more to field the box kicks from Conor Murray. Last week, May was snaffling them up without any bother; Kinghorn's a big fella who looks very confident under the high ball and I think he'd nullify the box kcik better than Maitland. Otherwise, that's a good line up. Looking forward to it. We won’t win anything with school boy errors that we’ve seen so far. This is game is Scotland to a tee. Lots of endeavour let down by ridiculous mistakes. Back to being the Scotland of a few years ago, stupid errors and passes all over the pitch. Physically impossible for the Ireland defensive line to make contact that far behind the gain line without them being offside. Pleasing how often we’re leathering Sexton. I think Ireland put Hogg out of game with illegal 'tackle' but we might see at half time. Just showed it. Deliberate red card offence - Peter O'Mahony though didn't catch his shoulder so probably not the cause. Still in the game after that difficult period. Carberry looks like he's never played at 10 in his puff. Nervous a hell. I'd be sending torpedoes down his throat, as per Sexton. Playing well but our own worst enemy again. Lapses in concentration at key moments. Overall a lot better against a stronger side physically and everything including confidence. Second half will show it we are stepping up. We need to be ahead come 60 mins. Our depth is nowhere near the quality of Ireland’s and so we need points on the board by then. C'mon Scotland, pump this mob. Madness from Gray. ****ing errors. Too many mistakes. We're the better team but beating ourselves at the moment still. Player too much advantage. Ref would do the SFA proud. Defence nowhere to be seen again. But seeing how the referee is calling anything remotely flat as forward then how the **** is that not a forward pass.